With summer just around the corner, it’s important to remember that while it’s okay to have fun in the sun, it’s important to protect your skin. May is National Skin Cancer Awareness Month, and we want to help you learn how to protect your canvas. More than 3.3 million people are diagnosed with skin cancer annually, making it the most common form of cancer in the United States. Thankfully, skin cancer is one of the most preventable forms of cancer. With the daily use of sunscreen, the risk of skin cancer, sunspots, damage and wrinkles goes down drastically. In other words, sunscreen is the number one anti-aging product. We know you may have some questions, so we’ve laid out a few of the most popular ones below, according to the Skin Cancer Foundation. Common Skin Care Questions 1. What’s the difference between UVA and UVB? What do they even mean? Ultraviolet (UV) radiation is a part of the electromagnetic light spectrum that reaches the earth from the sun. This spectrum has shorter wavelengths compared to visible light, which makes it impossible to see to the naked eye. Ultraviolet A (UVA) is a longer wave UV ray that can cause lasting skin damage, aging and skin cancer. Ultraviolet B (UVB) is a shorter wave UV ray that can cause skin damage, sunburns and skin cancer. 2. What is broad-spectrum? Broad-spectrum sunscreens protect your skin from both UVA and UVB rays (see above). When buying a sunscreen, look for one that has both chemical and physical protection. 3. What’s the difference between UPF and SPF? UPF stands for Ultraviolet Protection Factor and is used for clothing and other fabrics that protect you from the sun. SPF stands for Sun Protection Factor and is a rating for sunscreens and other cosmetic products that contain sunscreen. 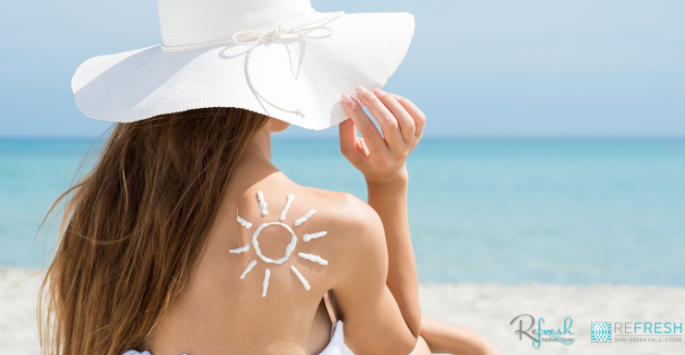 SPF is only used to rate a sunscreen’s ability to protect against UVB rays. Preventative Measures You Can Take to Protect Your Skin • Between the hours of 10AM-4PM, seek the shade. • Do not use UV tanning beds and when outside; avoid tanning. • When you’re outside, cover up! Use UPF clothing and sunglasses. • Sunscreen is key—use a broad spectrum (UVA/UVB) sunscreen with an SPF higher than 15 every day. When you’re outside, use a water-resistant, broad-spectrum sunscreen with an SPF of 30 or higher. Sunscreen should be applied to your entire body 30 minutes before going outside. • Make sure to reapply! Sunscreen should be reapplied every 2 hours (more if you’re sweating or in the water). • Examine your skin head-to-toe every month and see your health care practitioner every year for a professional skin exam. Using sunscreen daily is the single best thing you can do for your skin to minimize the effects of aging and the risk of skin cancer. At ReFresh Aesthetic Center, we carry effective medical-grade skincare products that make a difference in the health of your skin, but the first product we always talk about is sunscreen. Daily use of sunscreen will cause less degradation of your skin and keeps your skin younger and healthier. To find the best sunscreen for your skin, stop by our ReFresh Skin Essentials Store for a complimentary consultation or give us a call at (414) 255-2567.